Labour law is a highly dynamic and complex field which can be properly understood only in its broader international and historical context. Deakin and Morris: Labour Law, a work increasingly cited as authoritative in the higher appellate courts, provides a comprehensive analysis of current British labour law which explains the role of different legal sources, as well as social and economic policy, in its development. It thus enables readers to obtain a deeper insight into likely future, as well as past, changes in the law. The new edition, while following the broad pattern of previous editions, highlights important new developments in the areas of the contract of employment, discipline and dismissal, equality law, EU law, employee representation, human rights, 'work-life balance' policies, trade union law and industrial action law. The book examines in detail the law governing individual employment relations, with chapters covering the definition of the employment relationship; the sources and regulation of terms and conditions of employment; discipline and termination of employment; and equality of treatment. This is followed by an analysis of the elements of collective labour law - the forms of collective organisation, freedom of association, employee representation, internal trade union government, and the law relating to industrial action. 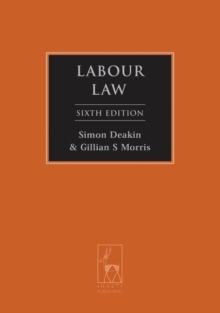 The sixth edition of Deakin and Morris: Labour Law is an essential text for students of law and of disciplines related to management and industrial relations, for barristers and solicitors working in the field of labour law, and for all those with a serious interest in the subject.